Looking for an easy activity for your child during spring break? Try this Make Your Own Word Search Puzzle idea. Using this free printable template, have your children start by writing words onto the graph that they want others to find. As they add a word to the graph, have them list the word at the bottom of the page so people know what they’re looking for. Once they’ve written enough words to hide, they can start adding in various letters in the remaining squares to hide the searchable words. Once complete, siblings can swamp puzzles with each other or the children can give their puzzle to a parent or relative to solve. 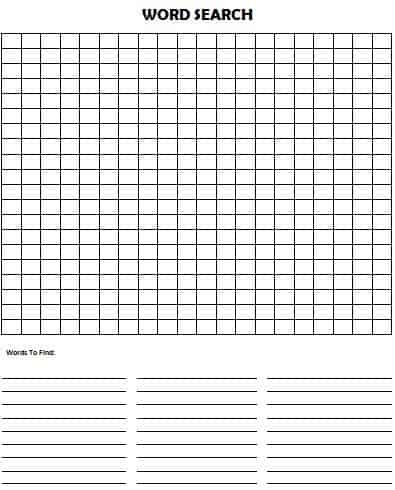 For more fun & free printable games, check out of Free Printable Games page filled with more word search puzzles, scavenger hunt games, BINGO cards, charades and much more. We’re always adding new & free printables and we don’t want you to miss out on any of them! You can follow along on Facebook (where we always post new ideas first), Pinterest (our most popular source of traffic and a great way to pin ideas to try later) and Twitter. We’re also now using Bloglovin’ for daily RSS feed updates. We’d love to see you as part of our community! As always, if you have suggestions for posts you’d like to see on Moms & Munchkins, please let us know!